For nearly 60 years, CRS has taken the lead in responding to natural and man-made disasters affecting Ethiopia's most vulnerable communities. 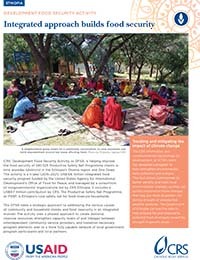 Moving beyond emergency response, CRS' disaster mitigation and recovery projects in drought and flood-prone areas have rebuilt individual and community assets through non-food aid in the form of agriculture, livestock, health, nutrition, and water and sanitation assistance. 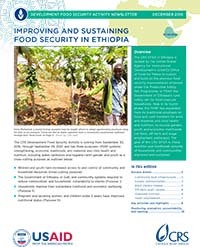 CRS's humanitarian work in Ethiopia also provides livelihoods support to farmers and entrepreneurs, promotes gender equality, mobilizes for immunization and mitigates the impact of HIV. An early relationship with St. Mother Teresa secured CRS as a long-time supporter of the sister's tireless mission to help the most vulnerable. 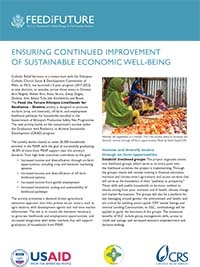 Worsening drought and hunger in the Horn of Africa imperils millions as foreign aid is threatened. Ethnic conflict and flooding cause millions of people to flee their homes. 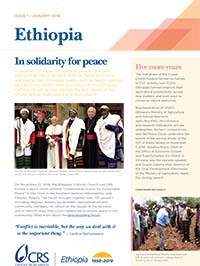 Catholic Relief Services has worked in Ethiopia since 1958. For 60 years, CRS has taken the lead in responding to natural and man-made disasters affecting Ethiopia's most vulnerable communities.